Over the last 6 years we have raised a total of £21,568 for very good causes both in Kimpton and further afield. We would like to record our sincere thanks to our many benefactors & helpers for their continued support over past years. We recently received a lovely update on some of the good things that the donations from the Kimpton Horse Show have helped to achieve from Kimpton Primary School, and wanted to share this with you all…. I thought you might like an update on how we are using the £100 donation we received from the Horse Show Committee. 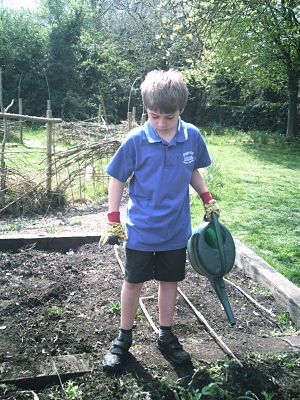 The Year 4 gardeners have now been provided with some cheerful gardening gloves to use in school. We have bought peas, carrot and sweet pepper seeds. The peas were sown indoors before Easter and have now been planted out in the school vegetable plot. The carrots have also been sown. In the next week or so we will be planting the sweet peppers for the children to grow and care for at home as they need more sheltered conditions than we can provide at school. 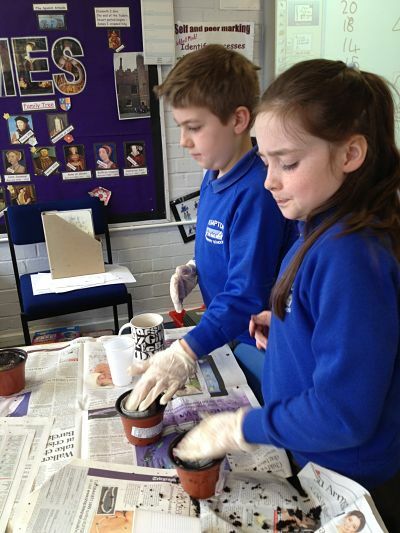 We intend to start looking at the flowering plants around the school over the coming weeks adding some bee friendly varieties wherever possible. 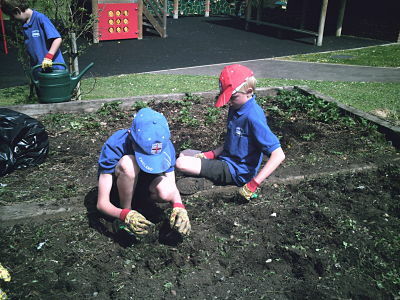 I have attached a photo of some of the children planting peas and tending the vegetable raised beds. We have purchased our first bird feeder and positioned it in our beautiful magnolia tree, it is easily visible from the Year 4 classroom, the staffroom and the hall. We intend to buy more feeders and a bird table for other positions around the school. Thank you once again for your generous donation, we will keep you posted on future progress. The 2011 Kimpton Horse Show celebrated proceeds of over £4,500 for the SECOND time in the 64 year history of the show. Congratulations to everyone involved. We are therefore decided to offer more awards for local worthy projects this time – as we did last year. We placed the invitation for applicants in this issue of the Parish Magazine and through the posters around the village. Donations to voluntary and charitable organisations in and around Kimpton village have also been received from us (see list below). We hope you all put the monies to good use. Could recipients let us know where it goes please…? We hope those listed below will again find our donations helpful in their endeavours, particularly as it is a bit more this time… do let us know. The committee would like to say a big thank you to all the sponsors of jumps, classes and those supporting the schedule with advertisements. You helped to make this unique and exceptional event possible. There were more than ever of you this time! Appreciations also to the judges and course builder who gave their time and expertise. A special thank you to the Bench Working Party for their efforts on the gate again. Thank you, in particular, to all the helpers on the gate, the tea-makers for the judges, the ring stewards, those who helped to erect the fences, tents and the rings beforehand and all those who helped to clear up afterwards. These helpers contribute of their time and energies freely to make the show such a success. All those villagers who helped to make up the crowd also contributed to make the show such a grand hit. Without each one of you it simply would not happen! THANK YOU. In order to raise further funds for local community and charitable causes is to invite sponsors for the new trophies for a modest figure. Some of you may like to sponsor a trophy in memory of a family member or a much- loved horse even. Local businesses in and around Kimpton may like to consider sponsoring a class, trophy or even one of our new coloured jumps! For information on how to go about sponsoring a class etc please contact the show chair on: 01438 832657. On the day of the Kimpton Horse Show there is always more to do than those offering to undertake it all. If you feel you could help, for maybe just an hour of your time – we would be delighted to welcome you to the team. Next year’s show is on Sunday 29th July 2012. Put it in your diary today. other ‘behind the scenes’ tasks. Just give us a call on 01438 832269.